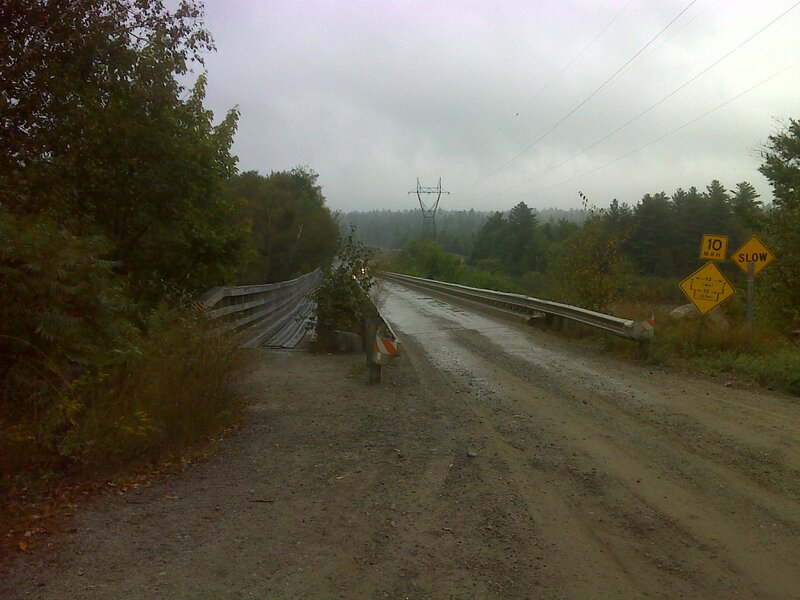 I left Millinocket and headed up to find Abol Bridge. It was hard to miss. I parked on the far side (west side) in a big wide gravelly area, prepared, and was on the trail southbound at 6:30. It was a cloudy, foggy, humid day. 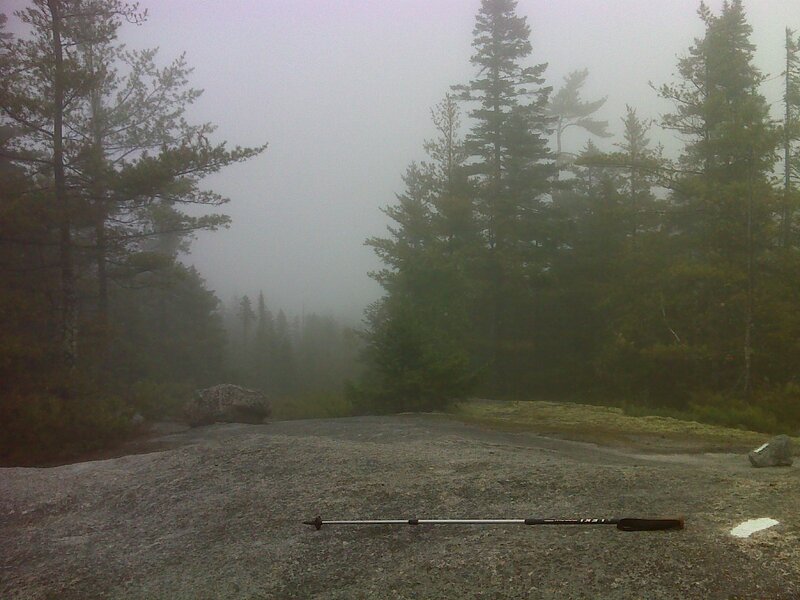 I had hopes that it would burn off, but instead the fog only got thicker as I hiked. Then there was a brief shower that got me and everything wet, and after that the thick fog kept producing drizzle for the rest of the morning. So needless to say, when I got to Rainbow Ledges there was no view of Katahdin, though the site of the Katahdin viewpoint was obvious—a corridor of cleared trees about 0.15 miles north of the sign marking the high point (which is where I turned around yesterday). The ledges area was still very pretty, with traces of fall color painting the foliage clinging to the solid granite slabs. The descent back north was gradual and virtually all the trail I hiked today was easy. 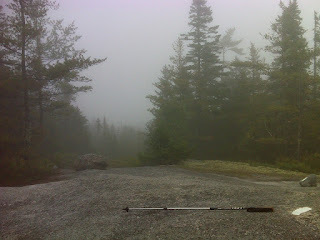 At the bottom of the gradual descent is Hurd Brook – a rock hop over big boulders, then the Hurd Brook Lean-To. From there it’s just a walk through the woods back to Abol Bridge. I got back there a bit after noon and considered quitting for the day because of the steady light drizzle. But I decided to hike at least a short leg north in order to make tomorrow’s hike a bit shorter (in case I have to start late because of the rain that was forecast). 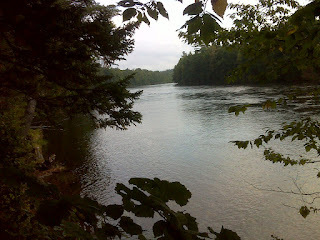 And I’m glad I did decide to hike, because the drizzle ended and there was some intermittent sunshine by mid-afternoon. The storms that I had worried about, thinking they might arrive in the afternoon, held off until well after dark, so I ended up hiking north for two hours, all the way to the lower ford of the Nesowadnehunk Stream. 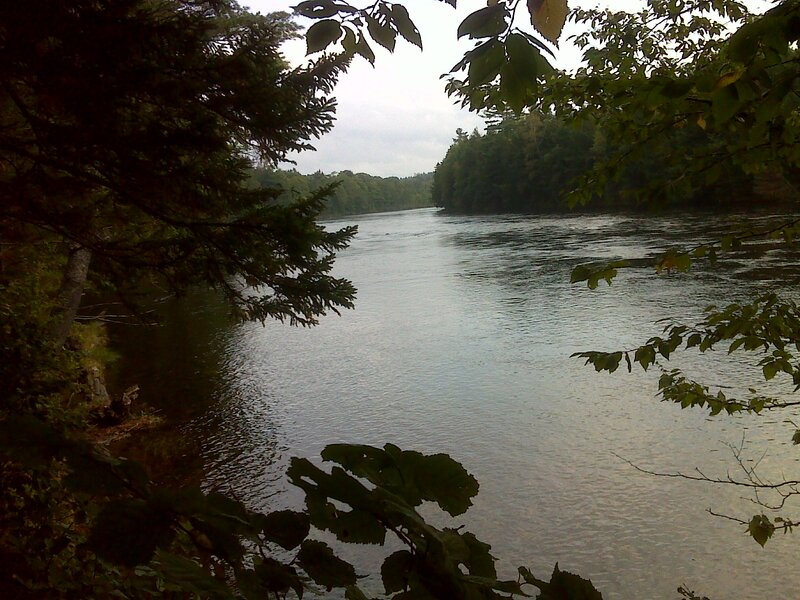 That entire two hour walk, mostly along the banks of the West Branch of the Penobscot River, was super-easy and very scenic. The river is fast flowing and big and wide. There were several groups of rafters riding down it, several fishermen, and the one negative: the sound of the traffic on the Golden Road coming from the other side of the river. Still, it was a pretty peaceful walk. I was finished at 4:10PM (finishing early just in case of early storms).